One of the (wondrous, blessed) perks of my job as a beauty editor is that brands will often send our team their latest launches to try and review. This means that I usually head straight to our beauty closet whenever I have a beauty emergency instead of the nearest Sephora or Ulta. (This does not mean that I don’t buy beauty products. You can see the products Team Byrdie spends our money on here.) Lo and behold, I happened to be home in Seattle for a week during Thanksgiving and had forgotten my (pricey) purple conditioner in New York. My newly platinum strands were looking a little yellow and drab, and I knew I needed to find a new purple shampoo to bring them back to life. With no beauty closet to rely on, I went straight to my neighborhood Ulta in search of a shampoo that 1) wasn’t too expensive, 2) wouldn’t dry my hair out, and 3) would make my platinum hair color blindingly bright again. I had been told that I needed to treat my platinum hair with extreme care, and since a lot of purple shampoos can be drying, I didn’t have high hopes. But I stumbled upon an unassuming $8 product I’ve never heard of, and it made my hair look so good, my mom complimented me on my color. For reference, when she first saw my platinum, she responded with, “It’s not permanent, is it? 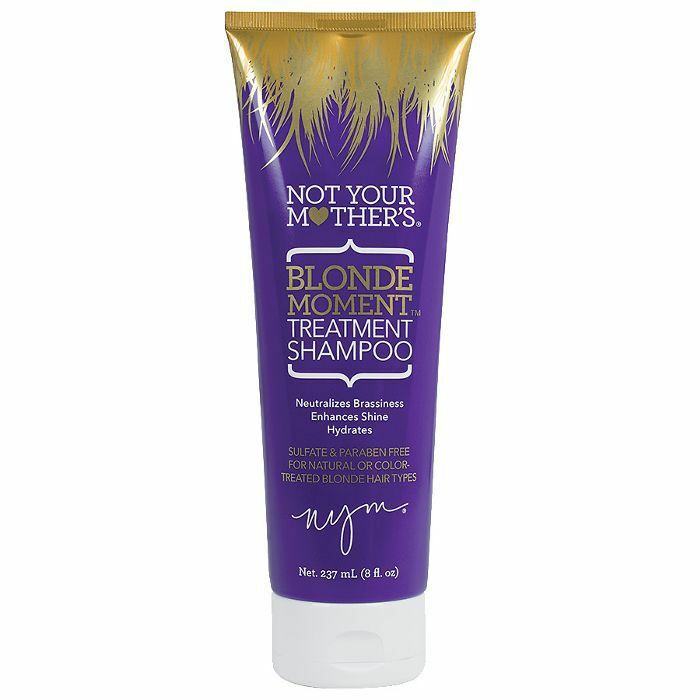 That product is Not Your Mother’s Blonde Moment Treatment Shampoo ($8). My friend and fellow platinum-haired beauty expert Carly Cardellino, the beauty director at Cosmpolitan.com, had warned me that purple shampoos could be drying and to use them sparingly. Thus, I was intrigued by the fact that this purple shampoo was sulfate-free, which usually means it’s made with gentler detergents that don’t strip your strands. I opened the tube and saw a deep-purple formula. Plus, it smelled pleasant and not cloyingly sweet like a lot of other other options I had sniff-tested. It had mostly positive reviews on Ulta, and since at that moment I realized I had left my wallet at home and only had a $20 bill in my purse, I purchased it mostly out of having no other choice. This budget-friendly shampoo—which lathered in the most satisfying way—left my strands looking noticeably brighter and shinier than before. The yellowish tint that had developed after I straightened my hair without heat protectant (oops) had more or less completely disappeared. My platinum hair felt soft and looked blindingly bright. As I mentioned earlier, my mom actually said something along the lines of, “Wow, looks so shiny,” after I came downstairs once my hair had dried (which is high praise coming from her). I’m so impressed by this shampoo and would recommend it to anyone who is looking for a purple shampoo that isn’t as drying as the more traditional formulas. The fortune-cookie moral of the story: Sometimes not having your wallet in a time of need can lead to great things. Click here for more purple shampoos with the best reviews.